Last week we found out that a Pitcher won the NL MVP Award. Clayton Kershaw was the NL Leader in WAR and no position player stood out enough to sway the majority of voters to pick them over Kershaw. After seeing Brisbee's tweet, I Did some quick research and found that over the past 22 seasons the #1 and #2 NL WAR finishers have always received at least 1 MVP vote. Here are the NL first and 2nd Place WAR finishers with the MVP pct of the 2nd place finishers. There it is - Over the last 22 years we have 44 players that have fininished 1 or 2 in NL WAR. Every one of them got an MVP vote except Cole Hamels. As expected pitchers finishing 1 or 2 are pretty likely to get dismissed. Nine times the WAR leader has been a pitcher Only Kershaw has gone home with the MVP award. In 1993 Jose Rijo's finished clear back at #21 despite a 10.2 WAR. He was also not among the 3 NL players to receive first place Cy Young votes. Although his pitching WAR was only 9.3, but it was still best among NL pitchers. 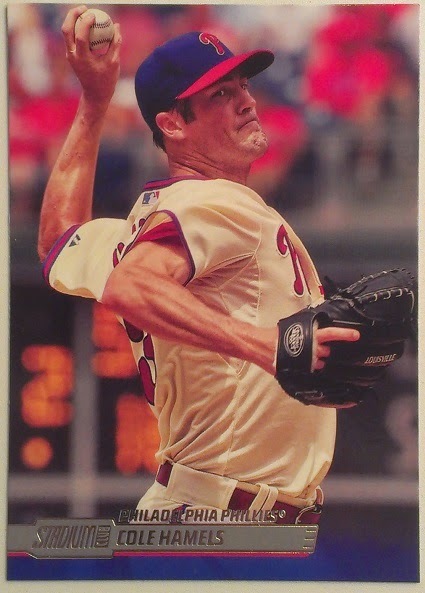 At this point in the Hot Stove - Late November - we are not sure that Cole Hamels will be in a Phillies uniform in 2015. Regardless we will project him and adjust as necessary in the future. As a Karma for the MVP Snub we are projecting big things for Cole Hamels - and In honor of Jose Rijo's near snub in 1993 we are projecting Hamels for a whopping +9.3 WAR for 2015. Ok it is a bit high, and it is based on nothing but a number of an unrelated pitcher from over 20 years ago, but it is my projection. If you don't like it, make your own calculation. The 2014 TSC card is a lot better than the 2008 card featured here. 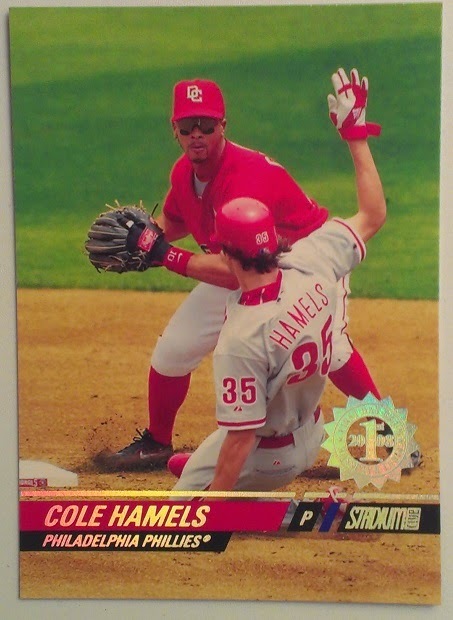 There is nothing wrong with this shot except that Hamels is the 2nd most important person on a 2 person card. 2014 Topps #US-280 Cole Gillespie: Error Card?